Q: What's that hook that Terry carries around with him? Q: What is 'On the Waterfront' about? There's no question that Elia Kazan and Marlon Brando are at their very best in "On the Waterfront". Kazan led a cast of solid talent in a morality play amidst the backdrop of the Depression-era New York waterfront. Brando, much calmer than in his mercurial performance in "A Streetcar Named Desire" (also directed by Kazan), personifies the best in "Method" acting, perfectly engaging the viewer with his genuineness as Terry Malloy. 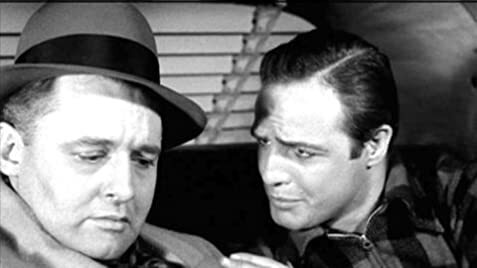 In the most famous scene, Brando, a has-been prizefighter, confronts his brother (Steiger) who is about to set him up to be executed by the mob bosses of the union. When Steiger reveals his intent to set Brando up, the scene explodes with reality and pathos. Brando's words, "Wow", sum up the intensity and emotion of the scene. Great acting and directing, however, cannot cover up the transparent political/apologetical intent of the movie. Two years earlier, Kazan had sold out his integrity to the House Unamerican Affairs Committee (HUAC), "naming names" of those who would become the blacklisted Hollywood 10. Kazan, a former communist himself, regretted his involvement with the Party, and evidently decided it was politically advantageous to name his former associates. Likewise, Brando character Malloy finds himself in a mob-run labor union, and in his effort to 'get out', repeats much of what Kazan did in real life. Worse, Kazan, through the allegorical message of the film, brands his former writers as criminals and murders, and himself as the naive innocent. Being a communist was no crime in the 30s, and he was no innocent. "On the Waterfront" is thus steeped in a right-wing political worldview. Mobs run labor unions. Unions are thus corrupt organizations who exploit workers and make it harder for businesses to thrive. Turn in union leaders into the police. Even the church becomes a tool of the state to further the cause of the police against the union. 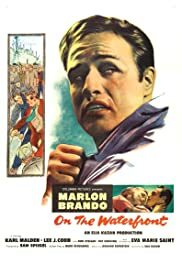 Brando was never satisfied with "On the Waterfront". In fact, he later commented that it was indeed a tool for Kazan to justify his actions to the HUAC. One thumb up for the acting, one thumb down for the cheap political message.